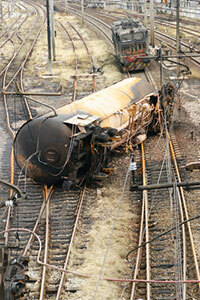 Causes of Train Accidents | Nashville Injury Lawyers The Law Offices of John Day, P.C. In Tennessee, trains are common carriers, a transportation service used by the public for a fee. Because of their status as common carriers, Tennessee requires train companies and railroads to exercise the highest degree of care for their passengers. But despite this requirement, train accidents do happen and almost always the accident was preventable. In fact, in 2012, there were 12 train-related deaths in Tennessee. For 2013, there have been 6 train-related deaths in Tennessee, and that figure is current only through August. The Federal Railway Administration categorizes the cause of train accidents into the following groups: track, signal, equipment, human factor and miscellaneous. Some examples of these are faulty brakes, mechanical failure of a signal, speeding, a poor decision by an engineer who is fatigued or under the influence. Following an accident, the railroad or train company will have investigators, lawyers and experts working to protect their interests. So if you or a loved one has been injured in a train accident, it is critical for you to have a team working to protect your interests. At The Law Offices of John Day, P.C. our award-winning attorneys will investigate your train accident and help you and your family get the compensatory damages and, if appropriate the punitive damages you deserve. We handle all train accident cases on a contingency basis which means we only get paid if we win. If you would like to schedule a free, no-obligation appointment, call us anytime at 615-742-4880 or toll-free at 866.812.8787 or simply fill out this form and we will call you.